These proven 12 must-have corporate blog tools and plugins can help to make the workflow of your business blog more efficient, increase productivity and boost success for corporate communication. Blogs have become an essential element of corporate communication. Business blogs can be the backbone of your corporate content marketing and the central hub for seeding content and for engaging with customers and targets. However, many corporate blogs stay far from expectation due to lack of time and resources for creating valuable content and a consistent posting frequency. Tools and plugins can help to make your workflow more efficient, increase productivity and boost success. We run 5 corporate blogs for our company and products. And we only have a small marketing team, that is also responsible for all other marketing tasks such as PR, social media as well as customer and corporate communication. To get our daily work done, we are bound to streamline our workflow and use our resources efficiently. We have looked at a multitude of tools and plugins over the years. The following set of tools and plugins have become our most valuable daily helpers. Slack is a professional messenger app that simplifies communication and chats. With Slack, we create group chats for our projects or discussion groups for specific products and topics. We share information on current events and developments, collect content for reading or for content curation. We can also chat with specific team members with a direct message. The tool also integrates with other productivity apps, like Google Drive, Trello or Canva (see below) to share documents and links for collaboration or approval. We work with a team that is based in different locations and Slack makes this very easy since the tool is accessible from any location and every device. Who does what, when and how? Is a new post or content item ready, approved and fit for publishing? Trello makes it easy to organize our projects, to prioritize tasks, and to schedule our campaigns. With Trello, we organize our entire collaboration processes and our editorial calendar. We can organize our projects and campaigns on flexible boards and cards. We create a separate board for each of your projects and campaigns. Within these boards, we create cards, lists, and maps for each subtask. We can assign team members, deadlines and priorities to the complete project and to specific tasks. Trello automatically reminds us when there’s something new or a comment or tasks directly addressed to someone. Trello also allows us to integrate other productivity apps we use, such as Google Drive or OneDrive documents or images from Canva for discussion or approval. Like Slack, Trello syncs your projects across all devices. Evernote is my personal favorite for collecting and clipping just everything I stumble upon. I use Evernote also to note and draft just about everything that comes to my mind. The greatest benefit of Evernote is, that it saves and syncs very quickly and smoothly between devices. However, the basic option has become quite limited over the years to the point that you can only sync between two devices. This is the main reason I opted for Premium. I can also save any data or notebook offline to all devices, to get my notes if I don’t have an internet connection. You can also forward emails and turn them into Evernote notes and there is a presentation mode that turns your notes into slideshows. Evernote uses cloud storage, and you can add a set amount of additional data each month, depending on your plan. Nobody is perfect. If you do not have a colleague or a professional proofreader in place, Grammarly will save your day. The tool helps us to check our copy for spelling and grammar mistakes and suggests alternative words and phasing. You can check your copy in the desktop tool or use the browser extension to detect mistakes in real-time when editing in WordPress, Evernote or Google Drive. This is really convenient. However, the browser extension sometimes interferes with forms. So you will have to turn it off and on occasionally. You can do quite a lot with the free version to get a basic check on your texts. For advanced grammar and phrasing features, you will need the Premium version. Extra Tip: Also check the Hemingway App as a free alternative for doing more than just spelling and grammar. The Hemingway App highlights lengthy, complex sentences and common errors in different colors. It calculates readability and shows where your text is too complicated for most readers to follow. It highlights adverbs, passive voice, and dull, complicated words. You can format your text with the toolbar. Content quality has become a key factor in search rank and visibility. Content quality shows in content relevancy, semantic context, and keywords. To check whether our website and blog contents meet the basic aspects of search engine optimization, Yoast is still the best tool to help us with these tasks. And, you don’t have to be an SEO professional to understand and work with this tool. Even if you don’t know much about SEO, Yoast SEO can help you to take care of the basics. The plugin analyzes your pages and posts. Yoast helps you to define your focus keyword, permalinks, meta title and description, images, meta tags, text structure, and smooth readability. This tool is a real help to make sure, each post applies to basic SEO rules. Extra Tip: For researching and analyzing keywords, we use the Google Keyword Planner, Keywordtool.io, and WordStream. Posts with images encourage 3.2 times more engagement such as likes, comments, and clicks. As we don’t have a professional graphic designer in our team, we use Canva to help us with the task. Canva makes it easy to create professional looking graphics, infographics and even motion gifs for our blog posts and social media updates. The tool offers a huge variety of templates, layouts, photos and icons you can use to create professional looking images and infographics. We have also used Pictochart and Easi.ly, but most of our creative work is done with Canva. Extra Tips: For stock photos, we use Pixabay, Prexels or Unsplash as well as Freepik.com to look for stunning vector graphics. You can upload any photo or graphic from stock photo collections or any other graphics to embed them in your Canva design. For creating motion graphics and memes we also use Giphy. Working with a team, you will probably know how difficult it is to remind your team members and blog contributors ever and ever again not to upload and publish insanely sized images that will slow down page speed and impact performance. This plugin helps you to stop worrying. It automatically resizes huge image-uploads down to a size that is more reasonable for display without losing quality. The tool also provides a bulk-resize feature to resize previously uploaded images, and optionally convert your images to the best file format. The EWWW plugin is configurable with a max width, height, and quality. You can choose pixel perfect compression or high compression options that are visually lossless. Whenever someone uploads a new image to your blog, EWWW I.O. will automatically optimize the image size created by any contributor or plugin and scale it down to the configured size. You can also use the EWWW online optimizer to upload and compress your images. Videos generate more clicks than any other content format on the web. By publishing videos on YouTube and other social channels, videos also help to improve search rank and visibility. And, it will drive additional traffic from video search and social media. We regularly create video tutorials for our products. Moovly is an easy-to-use tool to help us creating animated videos, how-to videos, and tutorials. Moovly provides graphics, objects, backgrounds, and sounds we can use to create the videos. Icegram provides a multi-purpose solution with many great features for opt-in, list-building, and email subscriptions forms. You can easily create professional looking opt-in forms with customizable call-to-actions, create popups, welcome bars, and other opt-ins to generate leads and subscribers. You can also show forms to targeted visitors. The plugin integrates with many standard email marketing services. We use it with the Sugar CRM. All basic features are for free. The premium version provides even more features for advanced email marketing campaigns such as split testing, geo-targeting or more fancy styles and designs. Extra Tip: For “classic” lead generation we also work with the Icegram Email Subscribers and Newsletters plugin for creating blog and newsletter subscribers and with the One Signal plugin to create push notification. Placing social media follow buttons in visible places on your blog allows you to collect more followers and returning blog visitors. Social media share buttons make it easy for your readers to share your content with the social worlds and bring more visitors to your blog. And, always add a call-to-action to nudge your readers into action. There are virtually hundreds of thousands of options for social media follow and social media share buttons available as plugins. Starting from a Simple Share Buttons Adder to a complex and fully customizable all-in-one Super Socializer – Social Share, Social Login and Social Comments Plugin. The latter connects with more than 100 social networks and social counts, icons for the top or bottom of your content or with horizontal or vertical floating bars, social login, and integration for social comments. Extra tip: We also use WWM Social Share On Image Hover plugin for offering more options for our readers to share our images and Better Click2Tweet plugin to create tweetable boxes for our readers. Social networks are our primary seeding channels for promoting our blog posts and contents. Blog2Social is a comprehensive social media plugin solution for scheduling and sharing blog posts and other contents with fully customizable social media posts on a wide range of social platforms. This allows you to automatically cross-promote our blog posts directly from the WordPress dashboard. The plugin connects to Twitter, Facebook, GoogleMyBusiness, LinkedIn, XING, Instagram, Flickr, Pinterest, Diigo, Reddit, Tumblr, Medium, Torial, Bloglovin and VK, personal profiles as well as pages and groups. A social media calendar helps with scheduling and re-sharing content regularly across multiple channels. The particular strength of this tool is the range of features for customizing and tailoring posts for each social platform. Blog2Social automatically turns all post into an adapted format for each network and includes hashtags where possible. You can auto-post per default or preview and customize your social media posts. However tempting auto-posting is, we always select the customizing option as we strongly believe that social media communication should be as humanized as possible, and this tool combines individual messaging with as much automation as possible. Blog2Social is free for sharing and customizing your posts on social media but you might also find it worth to try the Premium version for the more elaborate features. There will be no blogging success without taking a look at your performance. 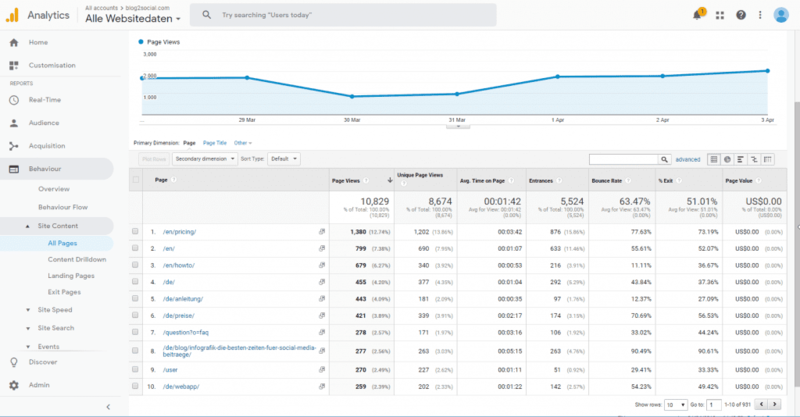 To track our results, we basically use Google Analytics for analyzing and reporting our blog traffic. Google Analytics enables you to review post performance by tracking landing page quality and conversions according to your goals. You can identify good and poorly performing posts by funnel visualization. You can see where visitors came from, how long they stayed on the site and how many pages they browsed. It also provides more advanced features, including custom visitor segmentation. You can open Google Analytics in your browser to look at your blog stats. But it is definitely more convenient to use plugins, such as the Google Analytics Dashboard plugin or Google Analyticator plugin. These tools put those stats right on your WordPress dashboard. If you’re regularly checking your stats on page views and performance of your posts, the plugins help you keeping track of your stats more quickly and conveniently. Extra tip: For a life analysis of your blog visits and reader behavior, the Wassup or the Crazy Egg plugin enables you to see how your visitors move on your blog and on your posts. There are thousands of tools and plugins that promise to help you with your daily work, but not all tools will work for you. We hope this list helps you to pick out some proven tools for your daily work. Let us know if you have tested some of the listed tools or which other tools work best for you? Melanie Tamble is an expert on Corporate Communications. Melanie is also an expert in content marketing, public relations and social media. She worked as corporate communications manager for corporations like Microsoft and Abit, before starting her own company in 2000. Melanie Tamblé is co-founder and co-CEO of Adenion GmbH, based in Germany, where she provides apps and tools for businesses and agencies of any size to support their online marketing tasks. With Blog2Social the Adenion team provides a smart social media automation tool for cross-promoting, syndicating and scheduling marketing contents across multiple social media sites. The tools and services are dedicated to help clients customizing their contents into engaging social media messages for each social community and to ensure an consistent content stream on their timelines. Hey Tamble..I have been searching for good article like this that will hint me on how to set up a good corporate blog. You nailed it. Thank you for the information, well explained and concise. Kudos!